We went to Beth and Egan's place to grill out and play some games while trying to finish off some wedding wine. 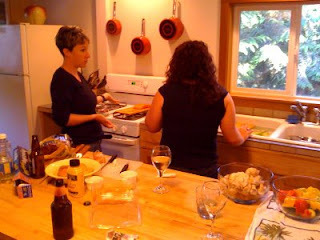 We had salmon, halibut, sausages, veggies and corn on the cob. It was a great way to end our time in CB, even though we never got in the hot tub--despite Beth's "Ice Storm" references to a key party.